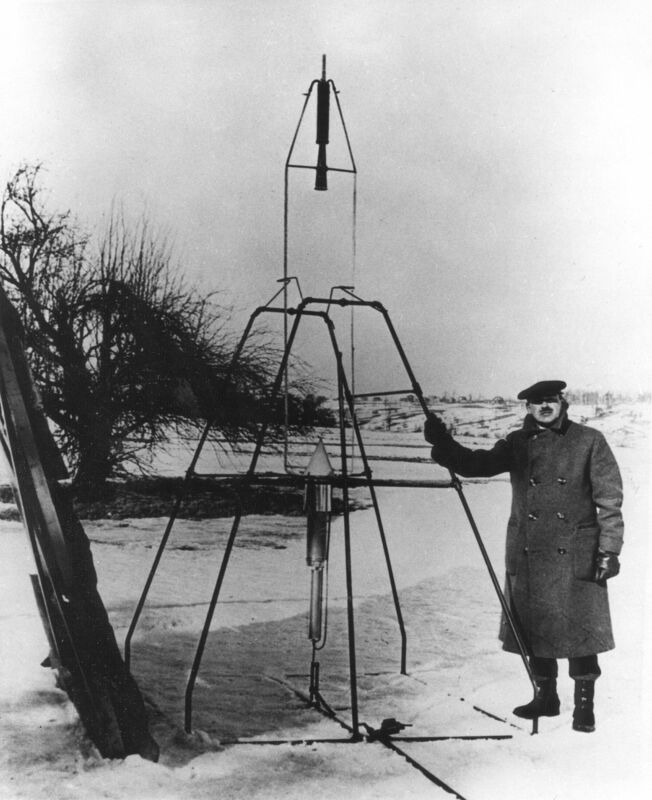 "Robert Hutchings Goddard, born on October 5, 1882, is wide­ly regarded as America's first true rocket scientist. A native of Massachusetts, Goddard was educated at Worcester Polytechnic Institute, and later taught physics at Clark University. "The New Englander's passion for rocketry began during his childhood and eventually became his life's work. At the age of 27, Goddard published A Method of Reaching Extreme Altitudes, which hypothesized that a rocket launched from Earth could reach the Moon. Like many visionaries, the young rocketeer encountered numerous skeptics. In January of 1920, the New York Times harshly criticized Goddard's theory that rockets could be utilized for space exploration: 'He seems only to lack the knowledge ladled out daily in high schools.' Forty-nine years later, as Apollo 11 raced to the Moon, the famed newspaper published a retraction to its article criticizing Goddard. "Goddard launched his first liquid-fueled rocket from his Aunt's farm in Auburn, Massachusetts in March of 1926. Nicknamed Nell, the 10-feet-tall, 10.25-pound rocket was powered by gasoline and liquid oxygen contained in fuel tanks attached by rigid tubes to a small engine. Once the gasoline and oxygen mixture was ignited in the combustion chamber, the hot gasses exploded out a small nozzle at the base of the rocket. Racing into the air at 60 miles per hour, Nell's maiden voyage lasted a mere 2.5 seconds, reaching an altitude of only 41 feet, before landing 184 feet down range; nonetheless, it was a milestone in the science of rocketry. "After consulting with a meteorologist at Clark University, Goddard determined that the climate of New Mexico was ideal for year-round rocket launches. In July of 1930, Goddard, his wife, and four assistants, along with a freight car filled with rocket equipment, relocated to a remote area known as Eden Valley, near Roswell, New Mexico. There, Goddard established a rocket science labora­tory and test range, which included a launch pad and tower. "Derisively nicknamed 'Moony' Goddard by his critics, the am­bitious, but intensely private rocketeer received little support from the government. Over the course of four years, philanthropist Daniel Guggenheim provided Goddard with an annual $25,000.00 grant, while famed aviator Charles Lindbergh helped raise addi­tional funds, enabling the rocket scientist to pursue his dreams. "With the passage of time, Goddard's rockets grew more sophis­ticated, including the installation of gyroscopes. In 1929, Goddard launched the first instrument-containing rocket, which carried a thermometer, barometer, and camera high into the sky. Another of his liquid-fueled rockets broke the speed of sound (Mach 1) in 1935. Goddard subsequently developed a rocket that could travel 1.5 miles into the air at a velocity of 550 miles per hour. "Goddard continued to test rockets at his isolated desert facil­ity for the remainder of his life. In spite of his many successes, Goddard was never able to interest the U.S. military in rocket-pro­pelled weaponry. Eventually granted over 200 patents, Goddard continued to pioneer rocket science technology until his death in 1945. In his final days, he offered a vision of the future: 'It is just a matter of imagination how far we can go with rockets. I think it is fair to say, you haven't seen anything yet.' "